N310EA, the aircraft involved in the accident, in March 1972. 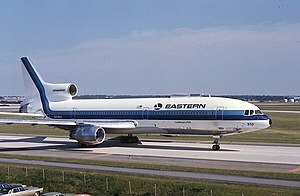 Eastern Air Lines Flight 401 was a scheduled flight from New York to Miami. On December 29, 1972, the Lockheed L-1011-1 Tristar operating the flight crashed into the Florida Everglades, causing 101 fatalities. The pilots and the flight engineer, two of 10 flight attendants, and 96 of 163 passengers died; 75 passengers and crew survived. The crash occurred while the entire cockpit crew was preoccupied with a burnt-out landing gear indicator light. They failed to notice that the autopilot had inadvertently been disconnected and, as a result, the aircraft gradually lost altitude and crashed. It was the first crash of a widebody aircraft and, at the time, the second-deadliest single-aircraft disaster in the United States. Eastern Air Lines Flight 401 was a regularly scheduled flight from John F. Kennedy International Airport in Queens, New York, to Miami International Airport in Miami, Florida. On the day of the crash, Flight 401 was operated using a four-month-old Lockheed L-1011-1 TriStar (registration N310EA,), which had been delivered to the airline on August 18, 1972.:30:99 The aircraft was number 310 in Eastern's fleet, and the tenth Tristar delivered to the carrier. Less than 10 seconds after this exchange, the jetliner crashed. The location was west-northwest of Miami, 18.7 miles (30.1 km) from the end of runway Nine Left (9L). :5 The plane was traveling at 227 miles per hour (365 km/h) when it hit the ground. With the aircraft in midturn, the left wingtip hit the surface first, then the left engine and the left landing gear,:8 making three trails through the sawgrass, each five feet (1.5 m) wide and more than 100 feet (30 m) long. When the main part of the fuselage hit the ground, it continued to move through the grass and water, breaking up as it went. Robert "Bud" Marquis (1929-2008), an airboat pilot, was out frog gigging with Ray Dickinsin (1929-1988) when they witnessed the crash. They rushed to rescue survivors. Marquis received burns to his face, arms, and legs—a result of spilled jet fuel from the crashed TriStar—but continued shuttling people in and out of the crash site that night and the next day. For his efforts, he received the Humanitarian Award from the National Air Disaster Alliance/Foundation and the "Alumitec – Airboat Hero Award", from the American Airboat Search and Rescue Association. In all, 75 survived the crash—67 of the 163 passengers and 8 of the 10 flight attendants. Despite their own injuries, the surviving flight attendants were credited with helping other survivors and several quick-thinking actions such as warning survivors of the danger of striking matches due to jet fuel in the swamp water and singing Christmas carols to keep up hope and draw the rescue teams' attention, as flashlights were not part of the standard equipment on commercial airliners at the time. Of the cockpit crew, only flight engineer Repo survived the initial crash, along with technical officer Donadeo, who was down in the nose electronics bay with Repo at the moment of impact. :102,108 Stockstill was killed on impact, while Captain Loft died in the wreckage of the flightdeck before he could be transported to a hospital. Repo was evacuated to a hospital, but later succumbed to his injuries. :107–108 Donadeo, the lone survivor of the four flightdeck occupants, recovered from his injuries. The National Transportation Safety Board (NTSB) investigated the accident. After descending 250 feet (76 m) from the selected altitude of 2,000 feet (610 m), a C-chord sounded from the rear speaker. :4 This altitude alert, designed to warn the pilots of an inadvertent deviation from the selected altitude, went unnoticed by the crew. :23 Investigators believe this was due to the crew being distracted by the nose gear light, and because the flight engineer was not in his seat when it sounded, so would not have been able to hear it. :110 Visually, since it was nighttime and the aircraft was flying over the darkened terrain of the Everglades, no ground lights or other visual sign indicated the TriStar was slowly descending. In response to the accident, many airlines started crew resource management training for their pilots. The training is designed to make problem solving in a cockpit much more efficient, thus causing less distraction for the crew. Flashlights are now standard equipment near jumpseats and all jumpseats are outfitted with shoulder harnesses. The story of the crash and its aftermath was documented first in John G. Fuller's 1976 book The Ghost of Flight 401. Fuller recounts stories of paranormal events aboard other Eastern aircraft, and the belief that these were caused by equipment salvaged from the wreckage of flight 401. Eastern Air Lines CEO (and former Apollo astronaut) Frank Borman called the ghost stories surrounding the crash "garbage". Eastern considered suing for libel, based on assertions of a cover-up by Eastern executives, but Borman opted not to, feeling a lawsuit would merely provide more publicity for the book. Loft's widow and children did sue Fuller, for infringement of Loft's right of publicity, for invasion of privacy, and for intentional infliction of emotional distress, but the lawsuit was dismissed and the dismissal upheld by the Florida Fourth District Court of Appeal. All parts that were cannibalized from flight 401’s airframe were eventually removed from other Eastern Airlines aircraft. The crash was also documented in Rob and Sarah Elder's 1977 book Crash. Two made-for-television movies based on the crash were aired in 1978: Crash, aired in October, was based on Elder's book, and dramatized the crash, rescue efforts, and NTSB investigation; The Ghost of Flight 401, aired earlier in February, was based on Fuller's book and focused more on the ghost sightings surrounding the aftermath. The crash was featured in Season 5 of the Discovery Channel Canada / National Geographic TV series Mayday, in a 2009 Season 5 episode called "Fatal Distraction". Musician Bob Welch recorded a song on his 1979 album Three Hearts titled "The Ghost of Flight 401". ^ The NTSB classified the injuries of one non-revenue passenger and one other passenger as non-fatal as their deaths occurred more than seven days after the accident. The death toll per the final accident report was 99. ^ a b c d e "Fatal Distraction". Mayday. Season 5. 2007. Discovery Channel Canada / National Geographic Channel. ^ Accident description at the Aviation Safety Network. Retrieved on June 9, 2012. ^ "FAA Registry (N310EA)". Federal Aviation Administration. ^ a b c d e f g h i j k l m n o p q r s t u v w x "Aircraft Accident Report, Eastern Airlines, Inc. L-1011, N310EA, Miami, Florida, December 29, 1972" (PDF). National Transportation Safety Board (report number AAR-73/14). June 14, 1973. Retrieved February 8, 2016. ^ a b c d e f g h i j k l Job, Macarthur (1994). "Chapter 12: Hey - what's happening here?". Air Disaster Volume 1. Aerospace Publications Pty Ltd. pp. 98–111. ISBN 1-875671-11-0. ^ "Robert "Bud" Marquis's Obituary on San Francisco Chronicle". San Francisco Chronicle. Retrieved December 10, 2017. ^ "Crash Survivors Honor Everglades Hero". PRWeb. December 7, 2007. Retrieved December 10, 2017. ^ "Lessons Learnt from the Crash of Eastern 401". Retrieved December 31, 2013. ^ "The Ghost of Flight 401". Goodreads. Retrieved July 22, 2017. ^ a b Serling, Robert J. (1980). From the Captain to the Colonel: An Informal History of Eastern Airlines. Doubleday. pp. 490–491. ISBN 0-385-27047-X. OCLC 5447734. ^ Loft v. Fuller , 408 So. 2nd 619 (Fla. App. December 16, 1981). ^ Elder, Rob; Elder, Sarah (1977). Crash. Atheneum, New York. ISBN 0-689-10758-7. Wikimedia Commons has media related to Eastern Air Lines Flight 401. "Eastern Flight 401 The Story of the Crash." The Miami Herald. Multimedia presentation on flight 401. This page was last edited on 17 April 2019, at 16:25 (UTC).